Canister vacuum cleaners are some of the most underrated types of vacuums on the market. Most of them are just as strong as a regular upright vacuum, but they are smaller and easy to maneuver. The Bissell 1161 Hard Floor Expert Deluxe Canister Vacuum is no exception. In fact, this particular model is one of the best on the market. It is powerful enough to pick up some of the toughest dirt and grime on your floors, but can also be gentle enough to clean your delicate curtains. 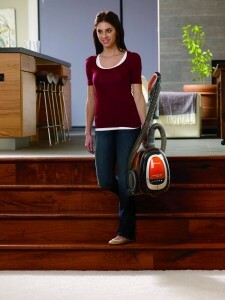 Being able to control the suction with your fingertips is one of the many features that makes this vacuum attractive. Why do People Like the Bissell 1161 Hard Floor Expert Deluxe Canister Vacuum? The majority of the people who buy this vacuum say that it is one of the best that they’ve ever had. One of the reasons is because it can clean a hardwood floor just as easy as it can a curtain. You can increase the level of suction to the point that it sticks to the floor and decrease it where it is gentle for curtains…all with a simple click with your fingertip. The non-marking rubber wheels and soft brush make it great for hard floors without scratching it. Upright and stick vacuums have a tendency to scratch the surface slightly when you make passes over it. This Bissell vacuum is much gentler, but still strong enough to get your cleaning done. Some people have said that this vacuum clogs up easily, despite the strong suction. If you use your vacuum cleaner frequently, or if you do a lot of heavy cleaning, then you may have to deal with unclogging it as you work. Another thing that people complain about is that the dust canister isn’t that big. As a result, you will have to dump it out a few times when you are vacuuming, depending on the size of the room and how dirty it is. Also, the 16’ power cord is a little short if you have to go in several rooms. You may need to get out an extension cord or just deal with switching outlets in each room. The Bissel 1161 is very easy to carry around. Being able to adjust the power of the suction is one of the best features that you will like about the Bissell 1161 Hard Floor Expert Deluxe Canister Vacuum. It is essentially a few vacuums in one because of the power adjustments that you can make. Whether you have hard floors, carpet or a combination of both in your house, this vacuum may be all that you need. With all of the different attachments and adjustments that you can make on the machine, you can easily use it all throughout your house. This is one of the better canister vacuums on the market, and as a result, it is a little pricey. It normally retails for around $150, but you can generally find a better deal. There are a few names in the floor care industry that are well-known worldwide, and Bissell is one of them. Part of that is because they have been around since 1876, but another part is because they continue to manufacture top-notch vacuum cleaners and other equipment. Whether you have a large house, a small apartment, pets or no pets, Bissell will have a vacuum cleaner that fits your needs. There is a reason why they are always near the top in terms of sales and customer satisfaction. If you make Bissell your next choice when purchasing a new vacuum cleaner, you won’t be disappointed.